Want to know the secret to flat abs? If so, you’re in good company, as that’s a desire shared by many. And while on the surface it might seem like the quest for a six-pack is all about vanity and looks, it turns out there are many health bonuses to a flat(-ish) stomach. Because here’s the thing about abdominal fat: we might hate the way it looks, but what it does to our health is far worse than any appearance concern. 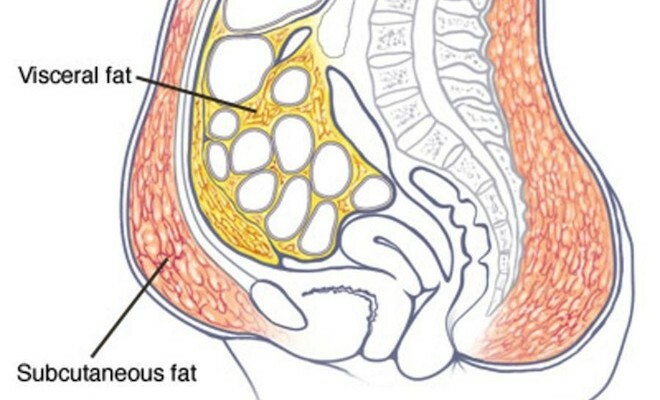 Fat that’s carried inside your belly – under the muscles – is called visceral fat, and it surrounds your vital organs, causing a whole host of health risks. Many factors play a key role in the storage of fat within the abdomen, including genetics, gender, hormones, age, menopause, eating habits, alcohol consumption and activity levels (1). It is also important to set the record straight about the another type of body fat, which is stored just under your skin. It’s called subcutaneous fat – for example, cellulite can be classified as this type of fat. When it comes to visceral fat vs. subcutaneous fat, even though we don’t like the way subcutaneous fat looks, it’s far less dangerous than the fat that surrounds our organs (2). Medical professionals used to use the Body Mass Index – an equation that takes into account your height and weight – to measure body fat, but research suggests it’s a flawed measure. It’s controversial because it doesn’t take into account your muscles. Sometimes people who have a high BMI in the “obese” category are actually carrying extra muscle because of their workouts or due to genetics. And likewise, people with normal BMIs might have very low muscle mass and, as a result, a higher-than-desirable body fat percentage. As a general rule, having a normal-range BMI with an excess of abdominal fat is more dangerous than having a total BMI in the obese range without excess belly fat (1). Researchers found that cardiovascular deaths were three times higher in people who weighed in the normal range but whose waists were bigger around compared to people with smaller waist measurements. That’s why keeping track of your belly fat situation can be more important than your BMI. There is also epidemiological data that indicates a strong association between central obesity (or carrying weight mostly in the midsection, with the body featuring an “apple” shape) and the increased risk of certain cancers (3). 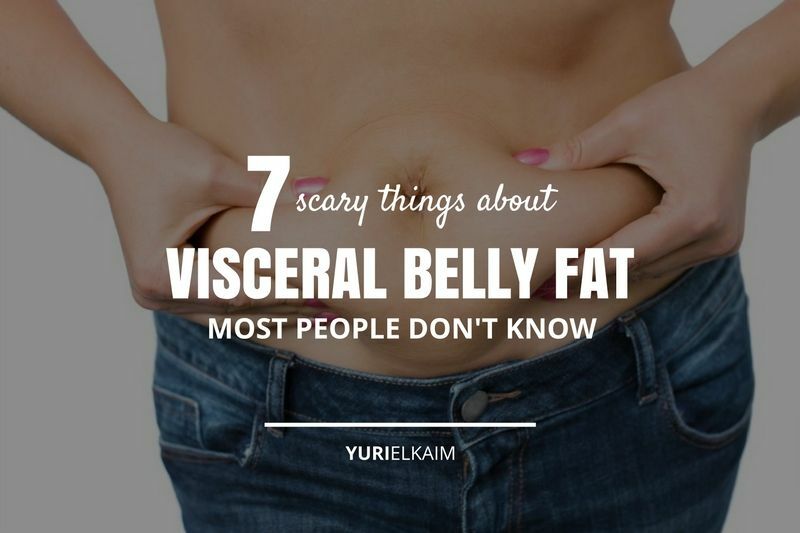 Visceral fat is sneaky – and you can have it even if you have a normal BMI and don’t have a protruding belly. Because it’s hard to see, it can be challenging to know if you’re affected by it. In basic terms, if you are sedentary with a normal BMI and a low muscle mass, you could fall into this category. With a low muscle mass, you could have more fat on your body than you realize, and as a result have the same risk of health problems as someone who is visibly obese. If you’re concerned, you should check with your doctor and have a body fat assessment done. Several studies have shown that abdominal obesity increases the risk of type 2 diabetes (4). Excess abdominal fat can cause metabolic issues like glucose intolerance, hyperinsulinemia (high levels of insulin), and insulin resistance, all of which contribute to type 2 diabetes. This is because ab fat is hormonally active, secreting a group of harmful hormones called “adipokines.” These hormones may impair glucose tolerance and can interfere with the normal function of hormones (5). This will makes you more susceptible to a whole host of health conditions such as cardiovascular disease and type 2 diabetes. In terms of insulin resistance – which is associated with both type 2 diabetes and central obesity – some of the main culprits are the increase in serum resistance levels and the release of the “cytokines” from fat cells. Specifically, cytokines can have a damaging impact on the systems that regulate insulin sensitivity, blood pressure and blood clotting (4). Bear in mind that insulin is a crucial hormone that helps the body burn energy. But when it’s thrown out of sync, it tends to lose its power and the body responds by pumping out even more insulin, causing hyperinsulinemia. This throws your body further out of balance in terms of fat burning and it also increases fat storage. A Harvard study reported that visceral fat is considered dangerous for your heart because it’s located near the portal vein, which goes from your stomach to your liver (6). Any chemicals released by cells within the visceral fat will have a negative impact on your liver, which is nearby and can lead to faster absorption. Blood lipid irregularities associated with central obesity includes high levels of triglycerides and reduced levels of HDL cholesterol, which causes an increase in the triglyceride to HDL cholesterol ratio (3). High triglycerides are often a sign of central obesity because when you eat, your body converts any calories it doesn’t need into blood lipids. They are stored in fat cells and although unclear about the mechanisms, high levels of triglycerides may add to hardening of the arteries, or atherosclerosis, reducing blood flow through the vessels (7). There is a huge link between atherosclerosis and the risk of strokes, heart attacks and disease. Current research suggests that high triglyceride levels can go hand-in-hand with poorly controlled type 2 diabetes and low levels of the thyroid hormones. Interestingly the thyroid hormones, T3 and T4, are pivotal to fat burning because they play an important role in controlling your metabolism. Also, one of the roles of HDL, the “good” cholesterol, is to mop up the LDL cholesterol within the bloodstream. It is well documented that increased levels of LDL blood cholesterol are related to an increased risk of cardiovascular disease in general. There is evidence to suggest that central obesity has a strong link with Alzheimer’s disease a d dementia. A 2010 study examined 700 adults and the results indicated that higher levels of visceral fat, regardless of the overall weight were linked to smaller brain volumes and dementia (8). Because belly fat has a strong correlation with many metabolic conditions, it increases the risk of Alzheimer’s disease. Although much of the research is in its infancy for Alzheimer’s disease, having too much visceral fat seems to be a strong correlating factor that can be controlled with the correct measures. It is well established that hypertension – or high blood pressure – is a contributing factor for heart disease, heart attacks, and strokes. High blood pressure is far more common in people who are obese (9). Studies have indicated that there is a very strong link between abdominal fat and hypertension, and that there is a particular association between obesity, insulin resistance, blood pressure, and variations in waist circumference (10). However just to make it clear: not all obese people have hypertension and/or insulin resistance. A followup to the Dallas Heart Study found the most significant associations between hypertension and visceral fat were observed in students with retroperitoneal fat, which is located around the kidneys (11). Researchers are still studying the effects of the fat around the kidneys as a catalyst for high blood pressure. Visceral abdominal fat can make breathing hard by decreasing lung volume, tightening the muscles around the trachea, and narrowing airways. This is commonly observed in individuals with obesity, because they their breathing is rapid and increased frequency, whilst inhaling smaller volumes of air (12). One study found that 75 percent of patients were more likely to be hospitalized with asthma if they were obese. Plus, abdominal fat can put more pressure on the lung capacity due to the fat’s excess weight. So maybe the reasons underlying our desire for flatter abs actually have more to do with our health than our looks. There are numerous studies pointing to the health hazards of visceral abdominal fat – from breathing to metabolic issues and cardiovascular health. The good news is, that with mindful changes in nutrition and exercise, you can make a real difference when it comes to whittling your waistline. Want to Flatten YOUR Abs? There are some time-saving tricks when it comes to achieving flatter abs. Discover my 7 unknown ways to lose belly fat and get toned abs – for FREE! You can download the Flat Abs Secret by clicking the banner below.